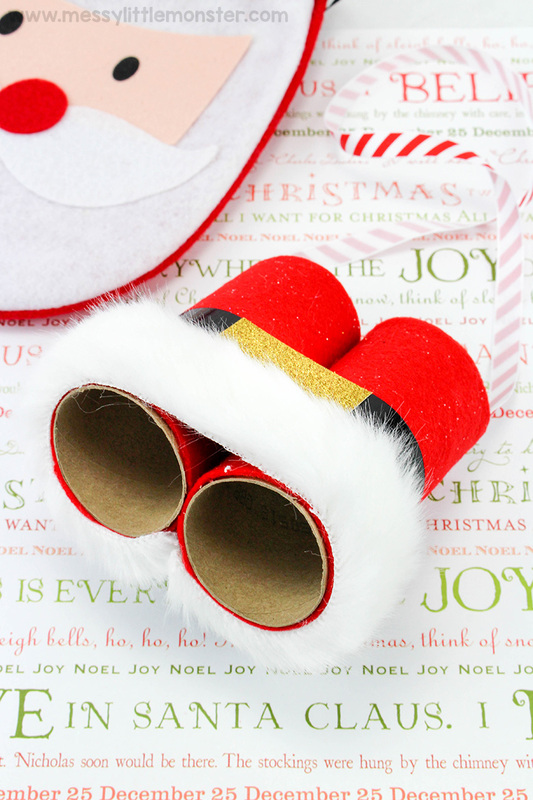 Santa Binoculars - A fun santa craft to search for santa! 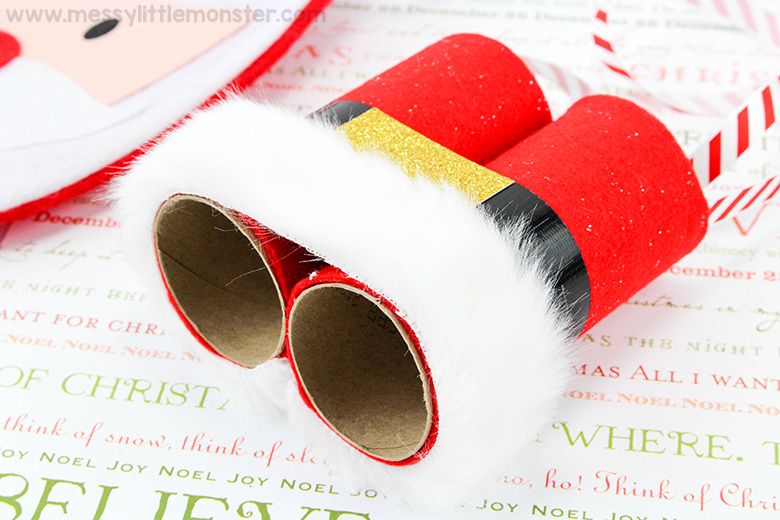 These Santa binoculars are such a fun Christmas Eve activity for toddlers and preschoolers. The kids are going to LOVE using them to search for santa!! Out of all the Santa crafts we've done... this is easily a favourite! 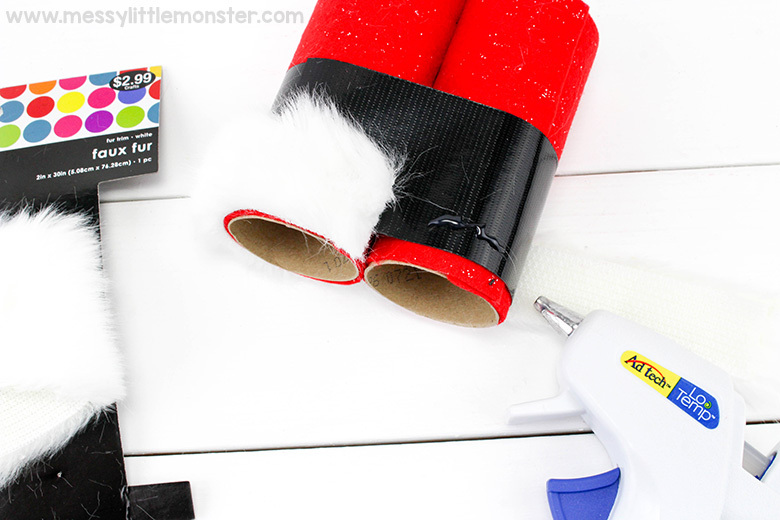 Get ready to look for Santa this year with this fun santa craft! Just scroll down below for the step by step directions to make your own Santa binoculars. If you're on the hunt for more easy Christmas crafts, be sure to check out these Santa handprint ornaments and these Santa and Rudolph spoon puppets! 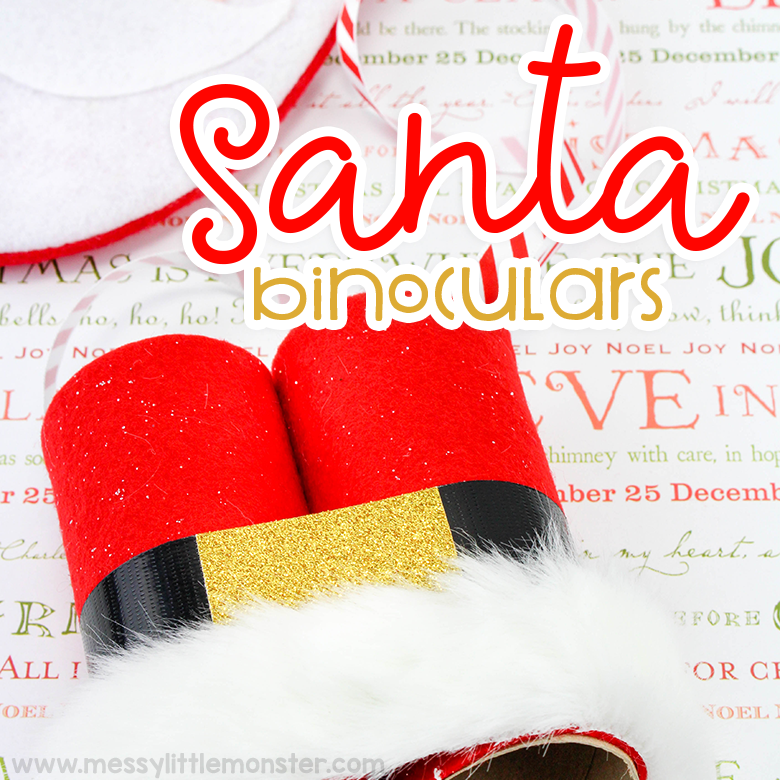 Santa binoculars make a really fun Christmas Eve activity for our little toddlers and preschoolers. It gets them into the spirit of Christmas and ready to look for Santa before bed! This is easily one of my favourite Santa crafts to do with kids. They get so into it and are convinced they can see santa! For added fun, you could use your santa binoculars to do a Christmas eve scavenger hunt around the house. There are so many fun things you can do with these Santa binoculars, just give them to your child and let their imagination go wild! 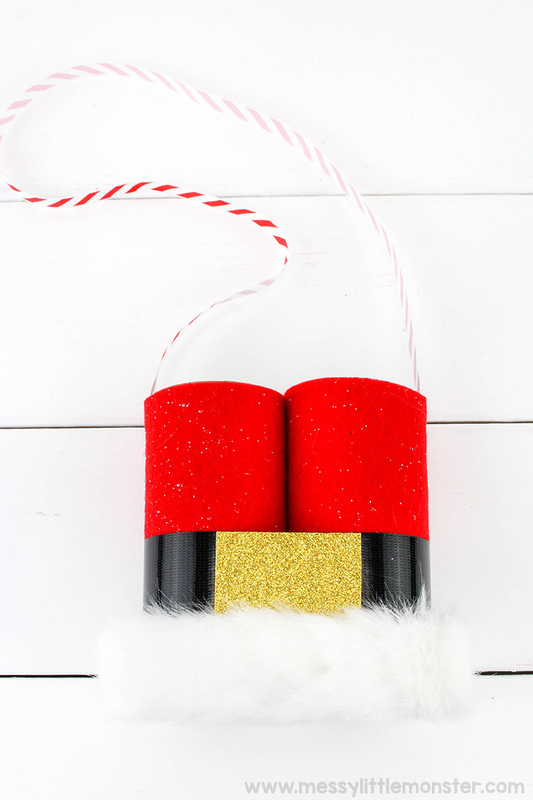 Scroll down below to see how to make your own Santa binoculars! Santa Binoculars - Search for Santa! Before you get started, gather up all your supplies for your Santa binoculars. It's so much easier when you already have everything laid out. 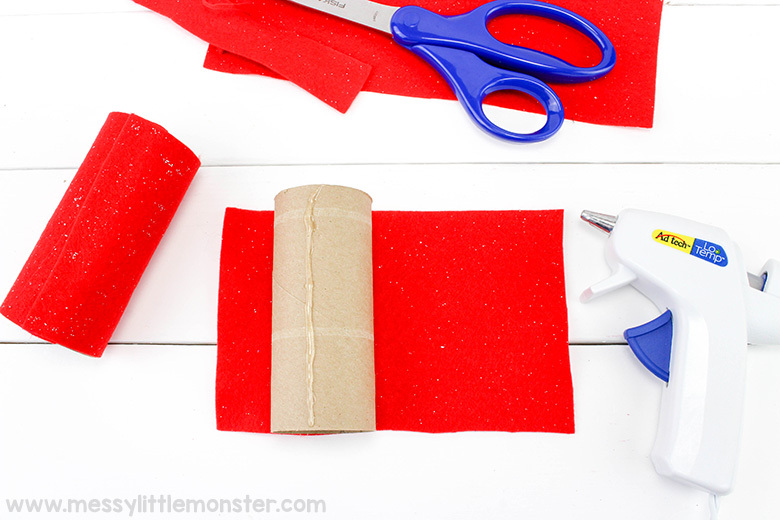 To get started, cut 2 large rectangles out of the red felt paper that are the width of the toilet paper tubes. Make sure they are long enough to cover the tubes. 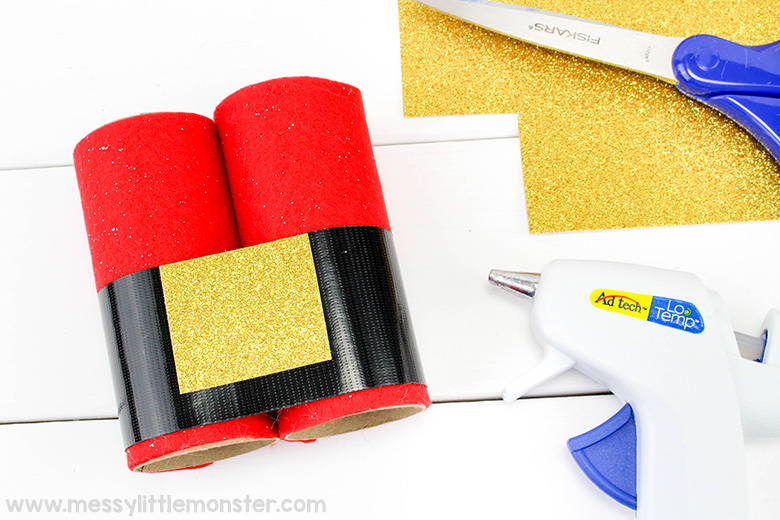 Apply a line of hot glue lengthwise along the tube and then wrap the felt paper around it. 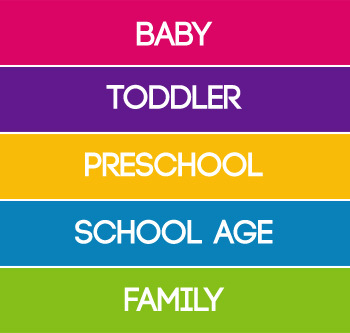 Repeat for both tubes. Alternatively you could paint the tubes with red paint, but you would need to add in drying time. Next, place both toilet paper tubes next to each other and wrap the ends in black tape, as shown below. Once you've done that, cut a small square out of the gold paper and glue to the middle of the black tape as you see below. 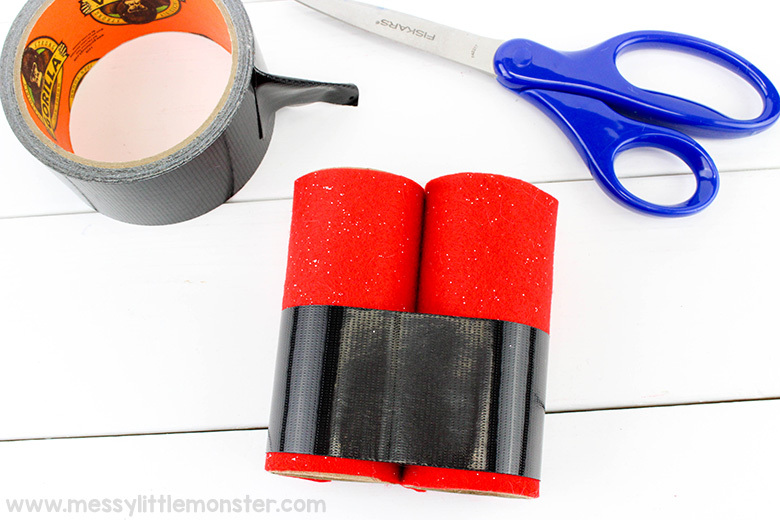 Wrap the faux fur around the end of the binoculars and cut to size. Once you're happy with it, glue them on with the hot glue. Next, add ribbon so the santa binoculars can be hung around you neck. Cut the ribbon or string to the desired length and then glue each end to the insides of the toilet paper tubes. Alternatively, you can glue the ribbon between the felt and toilet paper tubes, but this is a little more fiddly. Now it's time to go have fun looking for Santa!! 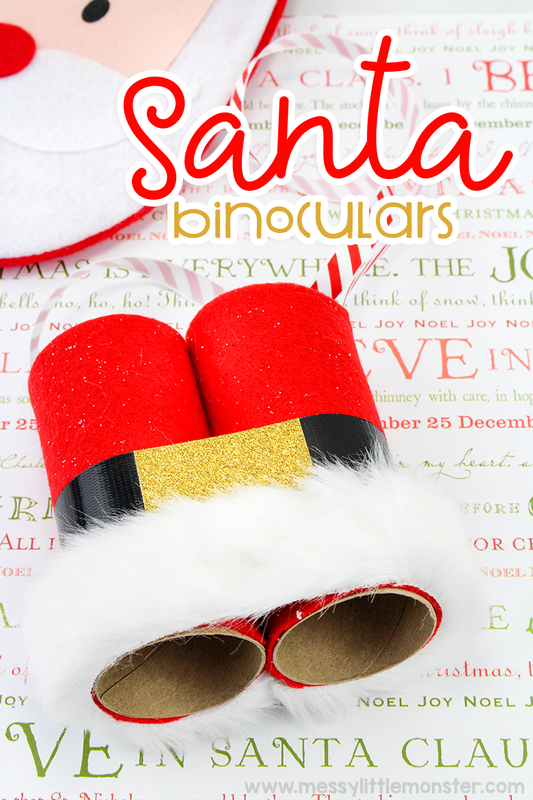 We hope you enjoy making these Santa binoculars with your toddler or preschooler! It's such a fun Santa craft to make with the kids as their excitement rises and it makes such a fun Christmas Eve activity. It is one of our favourite santa crafts and it is perfect to go with other games and activities as the kids wait for Santa to come. Have fun using your Santa binoculars to search for Santa!